Waves wash into this seawall at every high tide in Summerland, California. This large rock revetment reflects ocean waves in Carpinteria, California. 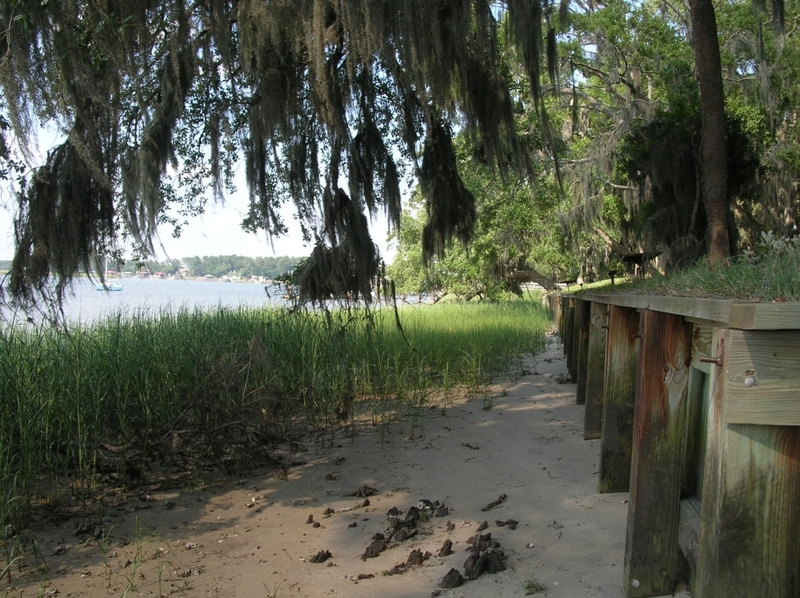 This timber bulkhead prevents shoreline migration in an estuary in coastal Georgia. 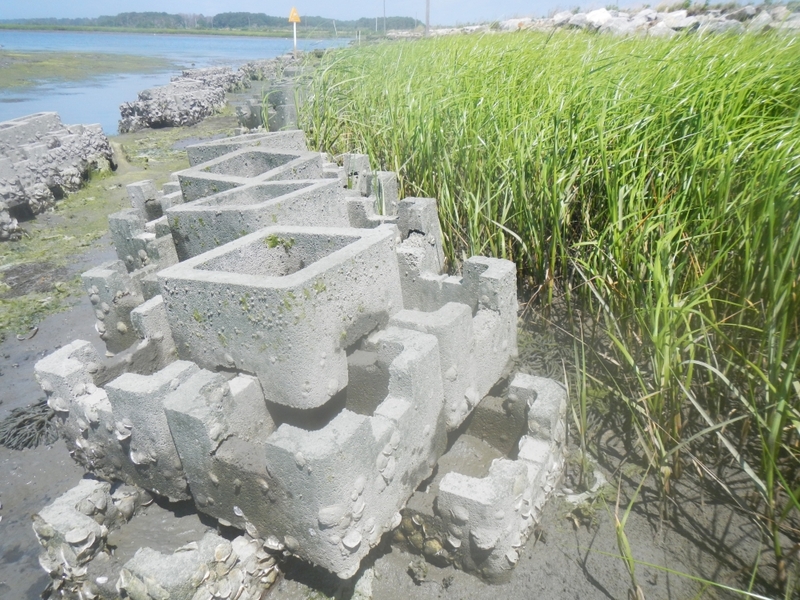 Oyster castles are used to reduce erosion of marsh shores in Cheaspeake Bay, Virginia. 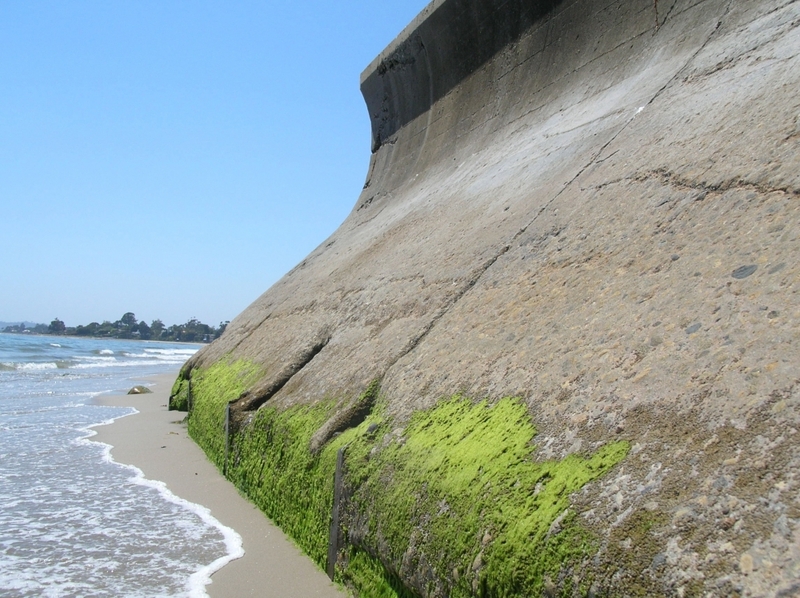 For nearly a century, the O’Shaughnessy seawall has held back the sand and seas of San Francisco’s Ocean Beach. At work even longer: the Galveston seawall, built after America’s deadliest hurricane in 1900 killed thousands in Texas. These are just two examples of how America’s coasts — particularly those with large urban populations — have been armored with man-made structures. Scientists from three very different LTER programs were already working on the ecological impact of coastal armoring at their respective sites. At the Santa Barbara Coastal LTER, studies of the effects of seawalls on open coast beaches had revealed significant ecological impacts extending up to birds. The Georgia Coastal Ecosystems (GCE) project conducted studies of the effects of small-scale armoring in salt marshes. Studies at the Virginia Coast Reserve LTER focused on the use of constructed oyster reefs and living shorelines as coastal protection strategies. “What was novel about this cross-site collaboration was putting these site-specific studies into perspective by making comparisons across a broad range of habitats,” said co-author Merryl Alber, a marine science professor at the University of Georgia and principal investigator of the GCE LTER project. The collaborative study synthesizes the findings of existing literature examining different types of armoring across a variety of soft sediment ecosystems. The scientists used that data to evaluate a new conceptual model they created during two LTER cross-site workshops. Of the 88 studies reviewed by the researchers, the majority had been conducted in very low-energy environments — predominantly salt marshes and tidal creeks but also mangroves — and about one-quarter in medium-energy systems, such as harbors, river mouths and estuaries. Only 15 percent focused on high-energy environments — mostly open coast sandy beaches. Across the six categories of ecological responses examined, the results of existing literature focused largely on changes in habitat and species distribution, leaving questions about how shoreline armoring affects other key ecological responses such as nutrient cycling, connectivity, productivity and trophic structure. Negative effects of shoreline armoring were reported in all six categories of ecological responses. According to Dugan, as sea level continues to rise, existing coastal armoring structures are likely to experience greater hydrodynamic energy regardless of their environment. This, she noted, will magnify ecological impacts in many settings. Other co-authors are Clark Alexander, James Byers, Alyssa Gehman and Natalie McLenaghan, all of the University of Georgia, and Sarah Sojka of Randolph College in Lynchburg, Virginia.